South Jakarta Fire Handling and Rescue (Gulkarmat) Sub-dept. gives fire handling socialization and training to 40 residents of Jalan Jati Padang 3, RW 05, Jati Padang, Pasar Minggu.
" 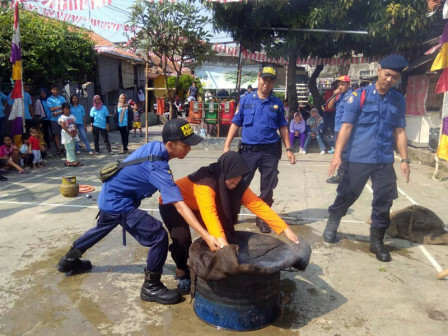 Residents from RW 05 consist of LMK RW 05, Karang Taruna, PKK, and Jumantik cadre want to learn and practice how to handle fire"
South Jakarta Gulkarmat Sub-dept. 's Pasar Minggu Sector IX Group A Head, Andang Wicaksana said this event was held at local resident's request. "Residents from RW 05 consist of LMK RW 05, Karang Taruna, PKK, and Jumantik cadre want to learn and practice how to handle fire," he stated, Tuesday (8/7). He explained, his side educated them about reporting procedures in case of fire, using fire extinguisher (APAR) and traditional way to handle and extinguish fire. Including to handle leak gas cylinder that can cause a fire. "We train them to do initial fire handling while waiting for firefighters to come," he continued. He also informed residents to directly call his personnel in 021-7817885 or 021-7515054 in case of fire or to call Jakarta Siaga in 112. "We train residents to practice using APAR and in traditiona l way of using wet sacks or wet towels to handle fire," he conveyed.